Congenitally corrected transposition, or l-transposition of the great arteries, accounts for 0.05% of congenital cardiac malformations with a reported incidence of 1/33,000 live births. In atrial situs solitus, l-transposition is levomalposition of the aorta; the morphologic left atrium connects across the tricuspid valve to the right ventricle, which gives rise to the aorta. A ventricular septal defect is the most common coexisting anomaly and is present in about 80% of patients. The natural history of l-transposition includes very high risk for abnormal conduction including complete atrioventricular block, likely stemming from abnormal positioning of the atrioventricular node that is often located anteriorly in the right atrium at the lateral junction of the pulmonary and mitral valve. At birth, 5%–10% of infants will have complete atrioventricular block; by adulthood, the prevalence of complete atrioventricular block increases to about 30% with a lifetime cumulative risk that continues to rise. Patients with l-transposition are at particularly increased risk of perioperative atrioventricular block, occurring in more than 20% of these patients at cardiac surgery. We report a patient with l-transposition who developed perioperative complete atrioventricular block at 5 years of age in conjunction with a modified double-switch operation, but had unexpected late recovery of normal sinus rhythm several months later. A Caucasian female was born with l-transposition of the great arteries along with a large ventricular septal defect. At 2 months of age, she underwent a pulmonary artery band procedure to limit pulmonary overcirculation [Figure 1]a. She remained clinically asymptomatic in normal sinus rhythm with preserved biventricular function. To prevent late complications from a systemic right ventricle, she had a modified double-switch operation performed at 5 years of age. Along with band removal and ventricular septal defect closure, she underwent an arterial switch operation and hemi-Mustard (inferior vena cava to the right ventricle baffle) atrial switch with bidirectional Glenn cavopulmonary anastomosis [Figure 1]b. This technique avoids superior vena cava suture lines within the atrium and may prevent later complications of baffle leak and sinus node dysfunction when compared to the traditional double switch. At the time of surgery, she developed complete atrioventricular block with a narrow complex escape rhythm, so a dual-chamber epicardial pacemaker system (Medtronic ADDRL1 Adapta DR, Minneapolis, MN, USA) was implanted 1 week later. On postoperative day 31, device interrogation confirmed ongoing atrioventricular block with 100% ventricular pacing requirement [Figure 2]a. On postoperative day 53, device interrogation showed >99% ventricular pacing requirement with one episode of breakthrough sinus tachycardia at 183 beats/min during a period of exercise, so her device was changed to Managed Ventricular Pacing (AAIR<–>DDIR). On postoperative day 84, interrogation revealed <0.3% ventricular pacing with a surface electrocardiogram that showed normal sinus rhythm with a PR interval of 144 ms and a rate of 114 beats/min; her P-wave morphology and PR interval matched her preoperative electrocardiograms. She remained in sinus rhythm with intact atrioventricular node conduction on multiple subsequent electrocardiograms, and device interrogations have shown no additional ventricular pacing. During an in-office pacemaker check to provocatively test her atrioventricular node more than 2 years later, atrial pacing at 180 beats/min showed 1:1 conduction, confirming normal atrioventricular node function [Figure 2]b. 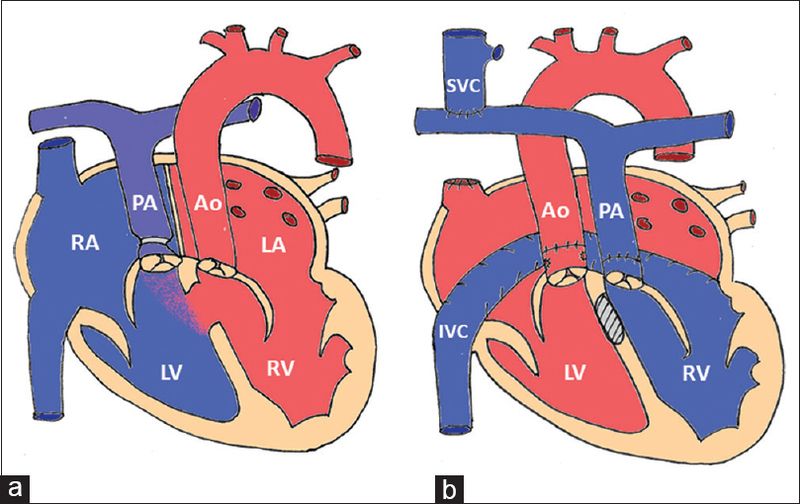 Complete atrioventricular block is a complication that can occur in 1%–3% of palliative surgeries for all congenital heart disease. While atrioventricular block may only be transient following surgery, patients with block that persists beyond postoperative days 7–14 are much less likely to recover atrioventricular node conduction. Weindling et al. reported that >95% of patients who regain atrioventricular node function do so by postoperative day 9. The current American Heart Association guidelines make a Class I recommendation for permanent pacemaker placement for complete atrioventricular block that is not expected to resolve or that persists at least 1 week following surgery for congenital heart disease. A small subset of patients may have late return of normal atrioventricular conduction following surgery for congenital heart disease. One institution reported that 7 of 72 patients had late return of normal atrioventricular node function at a median of 41 days (range 18–113 days). Another reported that 7 of 58 patients with pacemaker placement recovered conduction between 3 weeks and 7 years following surgery. Two of the patients cited in these reports had discordant atrioventricular connections, though the timing of their late recovery is unclear. Despite requiring pacemaker implantation, our patient's recovery of normal sinus rhythm more than 2 months after surgery highlights that, even for those patients particularly vulnerable to developing both spontaneous and perioperative complete atrioventricular block, late recovery of atrioventricular node conduction may still be possible. The views expressed in this article are those of the authors and do not reflect the official policy of the Department of Army/Navy/Air Force, Department of Defense, or U.S. Government. The identification of specific products or scientific instrumentation does not constitute endorsement or implied endorsement on the part of the authors, Department of Defense, or any component agency. While we generally excise references to products, companies, manufacturers, organizations, etc., in government produced works, this report presents a special circumstance when such product inclusions become an integral part of the scientific endeavor. Wallis GA, Debich-Spicer D, Anderson RH. Congenitally corrected transposition. Orphanet J Rare Dis 2011;6:22. Kouchoukos NT, Blackstone EH, Hanley FL, Kirkin JK. Congenitally corrected transposition of the great arteries and other forms of atrioventricular discordant connection. In: Kirklin/Barratt-Boyes Cardiac Surgery. Philadelphia, PA: Elsevier; 2013. p. 1772-2007. Anderson RH, Becker AE, Arnold R, Wilkinson JL. The conducting tissues in congenitally corrected transposition. Circulation 1974;50:911-23. Huhta JC, Maloney JD, Ritter DG, Ilstrup DM, Feldt RH. 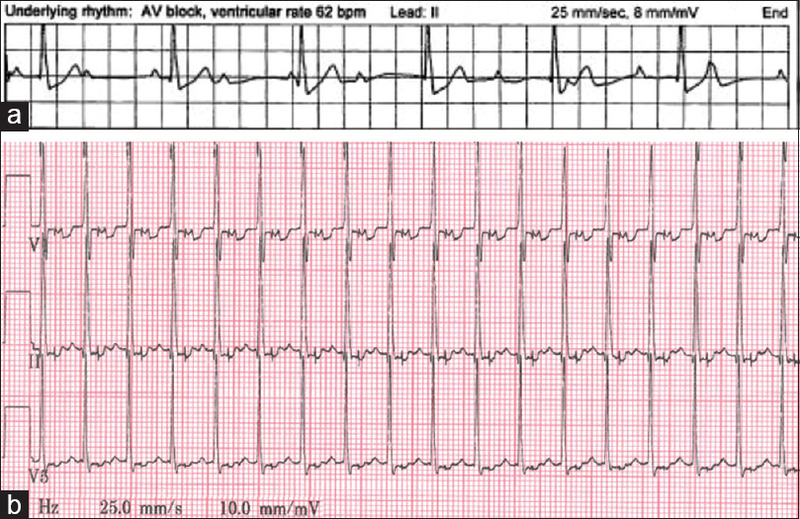 Complete atrioventricular block in patients with atrioventricular discordance. Circulation 1983;67:1374-7. Malhotra SP, Reddy VM, Qiu M, Pirolli TJ, Barboza L, Reinhartz O, et al. The hemi-mustard/bidirectional Glenn atrial switch procedure in the double-switch operation for congenitally corrected transposition of the great arteries: Rationale and midterm results. J Thorac Cardiovasc Surg 2011;141:162-70. Gross GJ, Chiu CC, Hamilton RM, Kirsh JA, Stephenson EA. Natural history of postoperative heart block in congenital heart disease: Implications for pacing intervention. Heart Rhythm 2006;3:601-4. Weindling SN, Saul JP, Gamble WJ, Mayer JE, Wessel D, Walsh EP, et al. Duration of complete atrioventricular block after congenital heart disease surgery. Am J Cardiol 1998;82:525-7. Batra AS, Wells WJ, Hinoki KW, Stanton RA, Silka MJ. Late recovery of atrioventricular conduction after pacemaker implantation for complete heart block associated with surgery for congenital heart disease. J Thorac Cardiovasc Surg 2003;125:1291-3.
van Geldorp IE, Vanagt WY, Vugts G, Willems R, Rega F, Gewillig M, et al. Late recovery of atrioventricular conduction after postsurgical chronic atrioventricular block is not exceptional. J Thorac Cardiovasc Surg 2013;145:1028-32.